The hyporheic zone is defined as a subsurface volume of sediment and porous space adjacent to a stream through which stream water readily exchanges. Although the hyporheic zone physically is defined by the hydrology of a stream and its surrounding environment, it has a strong influence on stream ecology, stream biogeochemical cycling , and stream-water temperatures. Thus, the hyporheic zone is an important component of stream ecosystems . In the last two decades of the twentieth century, active research on hyporheic zone processes has expanded from small mountain streams to large rivers, such as the Willamette River in Oregon, and even to glacial meltwater streams in Antarctica. Hyporheic science is interdisciplinary, involving hydrologists, ecologists, and biogeochemists. This article explores hyporheic zone hydrology, characterization techniques, and implications for stream ecology functioning. The hyporheic zone is defined by hydrology. In so-called "gaining" stream reaches, groundwater discharges into the stream, contributing to streamflow through streamside seeps or directly welling up through the streambed. In "losing" stream reaches, stream water infiltrates into a subsurface aquifer through the streambed or streambanks, causing a net loss of water to the stream. 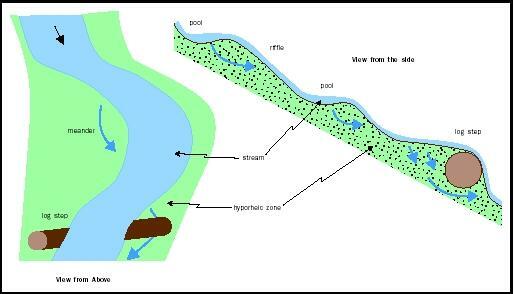 Hyporheic exchange is unique because the stream water that enters the subsurface (the hyporheic zone) eventually reenters the stream at some point downstream (see the figure on page 130). Short hyporheic flow paths (centimeter to meter scale) may be induced by streambed roughness features, such as sediment waves or rough gravel texture. Longer hyporheic flow paths (meter to several meter scale) are influenced by larger stream geomorphic features that exist within the stream reach, such as pool–riffle reach sequences, stream meanders, point bars, and boulder (or log) steps. 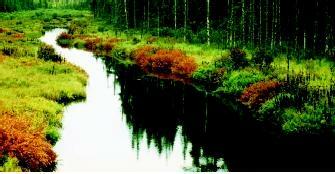 Water that enters the hyporheic zone moves at a much slower rate than water in the stream channel. Thus, hyporheic exchange increases the residence time of water within a stream system. Hyporheic flow paths can be lateral and/or vertical, moving in the downstream direction. The log step shown here has collected sediment behind it, forcing hyporheic flow into the streambed and under or around the log. Because it exists below the ground surface, a hyporheic zone adjacent to a stream cannot be easily identified or observed. As a result, scientists have developed techniques to help characterize the physical extent of the hyporheic zone and how quickly stream water exchanges into and out of it. One approach is to install numerous shallow wells to map subsurface water levels and sample subsurface water. In this approach, one could characterize chemical and physical interactions among groundwater, surface water, and hyporheic water to spatially define the hyporheic zone within a stream reach. The second approach, the stream tracer technique, consists of releasing a conservative tracer into the stream and collecting stream-water samples at a downstream location. The tracer effectively labels a parcel (volume) of stream water. As some of that parcel of water moves into and out of the hyporheic zone, it carries the tracer with it. Thus, sampling stream water at a downstream location allows one to quantify the amount of tracer, the timing of tracer arrival, and the array of tracer concentrations that move past the downstream sampling point. To characterize the influence of hyporheic exchange within the stream from injection point to sampling point, a solute transport computer model is used to estimate the magnitude of competing transport processes within a stream. These transport processes include (1) advection, the tracer moving at the mean velocity of the water in the stream; (2) dispersion, the spreading of tracer within the stream channel; and (3) hyporheic exchange. The goal of the modeling process is to simulate the collected data as closely as possible. Modeling allows scientists to describe the hyporheic exchange process by determining the values of model parameters that control hyporheic exchange. The well installation method and the stream tracer technique are not necessarily independent methods of hyporheic zone delineation. In many cases, these may be complementary approaches to investigating the hyporheic zone of a particular site. Although the hyporheic zone extent is controlled by surface-water penetration into the subsurface, hyporheic water is generally composed of a mix of surface water and groundwater. From a biogeochemical perspective, groundwater is generally low in dissolved oxygen and enriched in inorganic solutes compared to stream water. Thus, biogeochemical gradients exist within the hyporheic zone between two extremes defined by the surfacewater and groundwater end members. This makes the hyporheic zone a very active location of biogeochemical transformation of nutrients and other dissolved solutes. For example, in many small mountain streams, inorganic nitrogen—as nitrate (NO 3 ) and ammonium (NH 4 )—enters the hyporheic zone in stream water, but water exiting the hyporheic zone has far less inorganic nitrogen compounds. Microbes and biofilms may take up incoming nitrogen compounds or modify them through nitrification and denitrification processes. Denitrification, the conversion of dissolved nitrate (NO 3 ) to nitrogen gas (N 2 ), generally occurs in anoxic sediments (sediments without oxygen). Thus, dissolved oxygen gradients within the hyporheic zone may control gradients of denitrification. The hyporheic zone is an ecotone between stream water and groundwater environments, combining not only biogeochemical but also physical characteristics of both sources. The hyporheic zone provides an ideal habitat for a wide array of microbes and invertebrates. Hyporheic ecology is an emerging aspect of hyporheic science, and there are relatively few species of hyporheic fauna for which life histories and adaptation strategies are well documented or understood. Many hyporheic biogeochemical studies have recognized that the resident microbial communities are important in transforming incoming nutrients. Few studies have been conducted to describe and define hyporheic microbial communities. The hyporheic zone acts as a buffer for stream-water temperature, which is greatly influenced by local meteorology, conduction of heat from air, and energy input from solar radiation. Rapid and extensive hyporheic exchange moves stream water out of direct contact with solar radiation and overlying warm air. Further, groundwater is generally lower in temperature than streams, especially compared to summer stream-water temperatures. As warm stream water moves through the hyporheic zone, it dissipates heat, mixes with colder groundwater, and may return to the stream cooler than the stream water it returns to. Thus, the hyporheic zone helps regulate stream temperatures, particularly in small streams. The exchange of water between a stream and groundwater can influence stream hydrology, ecology, and physical characteristics such as temperature. The hyporheic zone where these exchanges occur is an especially important region of biogeochemical cycling and associated microbial activity. Defining spatial heterogeneity and controls of hydrologic exchange processes. SEE ALSO Aquifer Characteristics ; Ecology, Fresh-Water ; Fresh Water, Natural Composition of ; Groundwater ; Hydrologic Cycle ; Lakes: Biological Processes ; Microbes in Lakes and Streams ; Modeling Groundwater Flow and Transport ; Modeling Streamflow ; Runoff, Factors Affecting ; Stream Ecology: Temperature Impacts on ; Stream Hydrology ; Tracers in Fresh Water. Edwards, Richard T. "The Hyporheic Zone" In River Ecology and Management: Lessons from the Pacific Coastal Ecoregion, eds. Robert J. Naiman and Robert E. Bilby. New York: Springer-Verlag, 1998. Hauer, F. Richard, and Gary A. Lamberti, eds. Methods in Stream Ecology. San Diego, CA: Academic Press, 1996. Jones, Jeremy B., and Patrick J. Mulholland, eds. Streams and Ground Waters. SanDiego, CA: Academic Press, 2000. Winter, Thomas C., et al. Groundwater and Surface Water a Single Resource. U.S. Geological Survey Circular 1139. Denver, CO: U. S. Geological Survey, 1998.